Golf may be “the gentleman’s game,” but when it comes to getting a leg up on your competition, the game is anything but gentlemanly. Whether it’s fine-tuning their short game or buying new gear, golfers are always trying to get a leg up on the competition. In this article, we’ll be focusing on the latter. With the competition in golf as stiff as it is, you need all the help you can get. Some sports, like tennis or hockey, rely extremely hard on gear for performance. If you don’t have the top-of-the-line racket or skates, you won’t be able to compete with the pros. This is especially true for golf, but it doesn’t stop at golf clubs. There’s plenty more you can add to your golf bag to improve your performance. Here are the 9 best add-ons in the market. If you’re trying to improve your golf game, the thing you need most is practice. If you’re stuck behind a slow group of golfers out on the course, shag balls are the perfect target practice. No one wants to waste time out on the course, and practicing your swing on shag balls during those idle periods is time-well-spent. On top of practice, you also need data to improve your game. This nifty technology from Blast Motion can deliver just that. How it works is simple: You attach this little device on to the grip of your golf club and tracks the quality of your swings. It tracks the speed of your swing, measures your timing, and uses a compass to create a 3D map of each of your strokes. With this data, you’ll be able to hone in on imperfections in your game and adjust accordingly. When playing a new course, it’s helpful to know the ins-and-outs of the green, like the yardage of each hole. This watch is loaded with in-depth information of over 39,000 golf courses worldwide. It also has a digital scorecard and can display text messages and emails from your phone. If you don’t want to go the watch route, you can use a rangefinder like the Leupold GX to get extremely accurate yardage readings. This rangefinder can also record the incline or decline of the course, as well as the temperature and the altitude. Of course, you want to be able to intuit this sort of thing over time, but you can use this as a training tool. Before taking your readings, try guessing the yardage or incline/decline. You’ll find that you’ll get more accurate over time. It’s like developing a superpower! Golfing, like any other physical activity, becomes more difficult to do with age. But age or injury doesn’t have to prevent you from hitting the golf courses these days. If those intense swings when teeing off cause you too much pain you can get a little help from this piston-powered driver. With the hard part out of the way, you can still work on your short game. Speaking of your short game, it can benefit greatly with some updated putter grips, like these. Putters can be tricky and a lot of the stock grips on these clubs aren’t great for a lot of players. Since putting is such a fine motor movement, you need all the help you can get. One slip-up could ruin your performance on the course. These Lamkin putter grips add a little weight to your club, giving your put some more heft. This added weight theoretically smooths out your swing if you’ve got a hitch in your putting motion. The Swingbyte 2 Training Aid is a lot like the Blast Motion stroke analyzer but can monitor even finer motor movements. It monitors all the same things in your swings like speed, tempo, and angle. But it can also check for things like if you’re rotating your clubface accurately on drives. It also weighs less than an ounce, so having it clipped to your club shouldn’t affect your swing at all. The accompanying smartphone app is loaded with personalized lesson plans to improve your game as well. Golf requires that you have an iron-clad grip. You can’t tee off right if your hands are slipping and sliding around the grip on your club. If you don’t already have gloves, you should get a pair tailored perfectly for your hand. These gloves by Gfore, for example, have fine-tuned size options to ensure a perfect, snug fit. You’ll find that your golf game will improve a lot with a good pair of gloves. 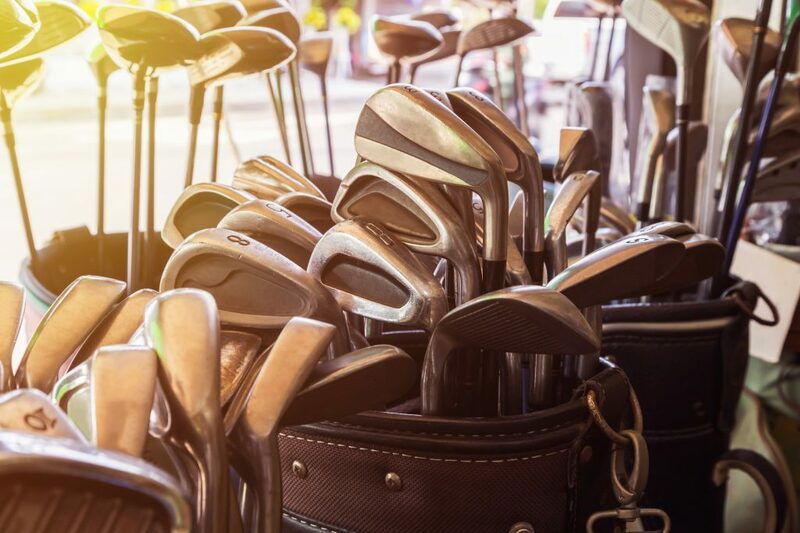 A good golf club is essential for good gold performance, but their quality is negated if you’re hitting rocks off the tee. Any quality golf ball will vastly improve your game, but we recommend the Titleist Pro V1 golf balls. It’s the ball most PGA pros use and for good reason. The ball is constructed with an ultra-soft outer layer perfect for soft puts around the hole. But it also retains enough aerodynamic qualities so that no power is lost when driving off the tee. Titleist ensures that using this ball will result in longer distance drives and more consistent flight. Ready to Hit The Green? With these golfing accessories, you’ll be able to improve your game and dominate the courses in no time flat. It’s important, however, to remember the fundamentals. A pair of gloves alone isn’t going to help you improve your game. It’s easy to get lost in buying new gear, but you need to remain dedicated to improving the basics of your game. If you need any more advice on recommendations on training golf gear, check out the training section of our website. Happy golfing!